GOQi wireless charging long wallet, power bank, charging pad, car & table stand, stationery stand, for a completely wireless charging lifestyle. Integrating fashion with technology for a better future. Compatible with all built-in Qi wireless charging phones (all latest Samsung phones S.6 S.7 Notes5 etc… and now iPhone 8, 8+ , X). All older iphone require the use of Qi wireless charging cases or receivers. It's official that Apple has adopted Qi wireless charging protocols for all future wireless charging for its phones, watch and headphones. This means all iphones will be compatible with all GoQi products. Better late then never. Well done Apple ! Click to view new GoQi wireless charging long wallet with slimmer & lighter design features. Click to view original GoQi wireless charging travel wallet. 2017 GoQi collection of wireless charging accessories for Iphone & android phones. Look at the day ahead with excitement and anticipation, shining through your personality and style. GOQI takes care of the minor details for you, so you can focus on the bigger picture. The normalisation of smart-tech into our everyday lives has so far missed out a key ingredient: the ease of charging all your different tools on the go. By integrating all your different chargers in one beautiful wallet, cables become a thing of the past for you. Tech companies often forlorn product design in order to emphasize functionality. At GOQI, we believe neither can exist without the other, so we’ve always worked hard to make our products both highly functional and exceptionally beautiful. Travel without worry. GOQi keeps you charged and organised wherever you go. No cables, no adapters, no worries. Less to carry, less to remember, less to worry about. U.S. Patent No. 9,729,003 For a Wireless charging device and method thereof issued August 8, 2017. Click here for patent details. Wirelessly recharging the wallet The GoQi wallet was designed so that it not only charges your phones wireless, but itself is also charged wirelessly when placed on a wireless charging station. A complete wireless charging solution We understand that not everywhere will have wireless charging stations, so wired charging is also an option. You can charge it from any laptop, computer, power strip or wall socket via our USB socket. Easy charging of wearable tech gadgets such as iWatch, trackers, headsets, or glasses There are many charging methods for each tech gadget out there, so we offer a USB socket with the GoQi wallet. A PASSION FOR CONTINUOUS IMPROVEMENT AND A VISION OF A MUCH GRANDER PICTURE FOR WIRELESS WEARABLES. We have tried out of hundreds of iterations. Here are 12 of them planned for future versions when our campaign is a success. 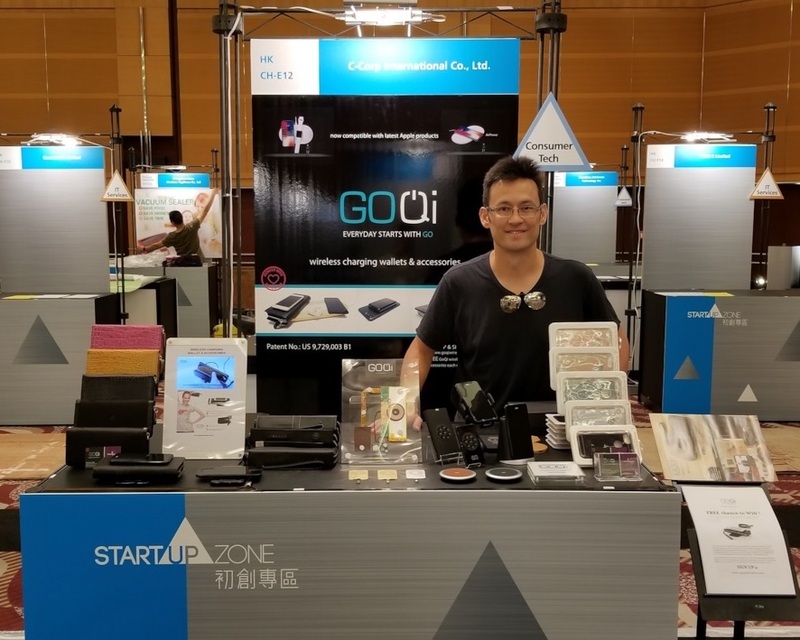 GOQI at Startup Launch pad. International buyers expressing very positive reactions to the range.